Thirty-five people have died in the past year from measles outbreaks across Europe, the World Health Organization has warned. It described the deaths - which can be prevented with vaccination - as an "unacceptable tragedy". A six-year-old boy in Italy was the latest to die from the infection. More than 3,300 measles cases have been recorded in the country. The most fatalities - 31 - have been in Romania. But there have also been deaths in Germany and Portugal since June 2016. Dr Zsuzsanna Jakab, the WHO regional director for Europe, said: "Every death or disability caused by this vaccine-preventable disease is an unacceptable tragedy. "We are very concerned that although a safe, effective and affordable vaccine is available, measles remains a leading cause of death among children worldwide, and unfortunately Europe is not spared. 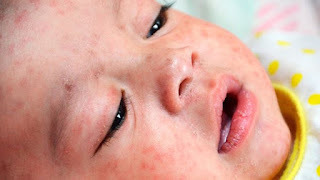 "I urge all endemic countries to take urgent measures to stop transmission of measles within their borders, and all countries that have already achieved this to keep up their guard and sustain high immunisation coverage." Measles is highly contagious, but vaccinating 95% of the population should prevent it spreading. Germany is looking at tightening the law on immunisations. And the government in Italy is pushing for children to be vaccinated against 12 common illnesses before they can enrol for state-run schools. Prime Minister Paolo Gentiloni blamed a decrease in vaccinations in part on a "spread of anti-scientific theories". A lingering false belief that the measles, mumps and rubella (MMR) jab causes autism is largely to blame, despite the claims being disproven and the doctor who made them being struck off.